Tanah Lot (meaning “Land in the Middle of the sea”) is special for me, because I braved my fear of driving in the streets of Bali to get to it. I rented a motor bike and made my own way to it. Thankfully, it was just as spectacular as I had been led to believe and it was worth all the cold sweat! The way there was an adventure in itself. First, I had never driven a scooter before, so I had to learn how to maneuver this thing. It’s a little different from driving a car and you feel a lot more exposed. Once you get used to the scooter, you have to brave the streets. There you will witness the most chaotic dance of cars, motorbikes and trucks swerving around each others. This chaos is accompanied by a cacophony of honking seemingly following a code, which you alone do not understand. And you have to forget about things that you take for granted, like the obligation to follow the lane system. You could find yourself driving straight toward a swarm of motorcycles, not unlike a swarm of bees, flying against oncoming traffic. Forget also about stop lights and come to term with the idea that signalization is entirely optional. You are are far from Kansas dear Dorothy. Yet, as I said, the temple was worth all the cold sweat as it was definitely the most gorgeous temple I have seen to date! 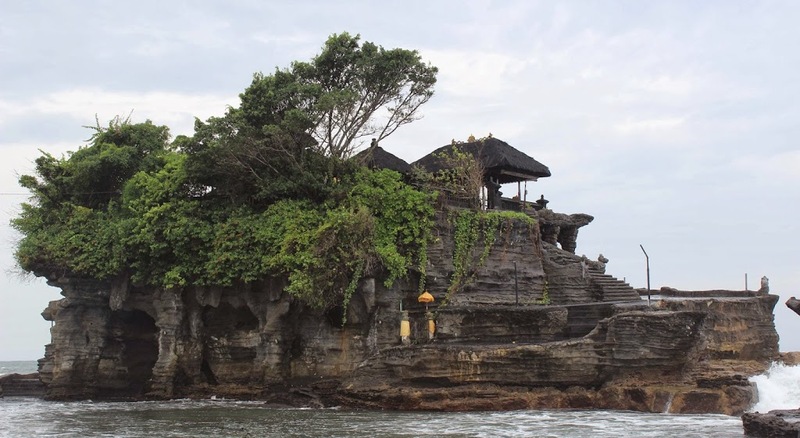 This temple is set on a rock in the water accessible at low tide. I was lucky enough to be able to make my way to it in the shallow water. There I was “blessed” (is this how you call it?) by the priest. I spent the rest of my time walking the grounds which, like Goa Gajah were quite extensive. They were beautiful in a different way, more rugged. However, like Goa Gajah, the site was quite a bit overflowing with tourists.